The first episode of Telltale’s Minecraft: Story Mode will release on October 13th, and since that is fast approaching we’ve been granted a new trailer. The episode is titled ‘The Order of the Stone’, which refers to a group of four adventurers who are famous for slaying the Ender Dragon. The Warrior, Redstone Engineer, Griefer, and Architect once upon a time headed into the End on their quest to rid the world of the dragon. Now something similarly evil is coming, and the Order must be found once more to help fend off disaster. On the quest to find The Order of the Stone is player character Jesse (who can be customised by the player, and be male or female), who is joined by a group of friends attending EnderCon. Their journey will take them across the Overworld, down into the Nether, and eventually to the End. Need to customise your main Minecraft character? Check out some of our favourite Minecraft skins. 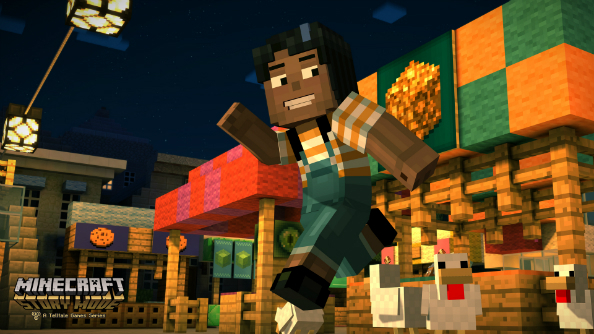 Minecraft: Story Mode releases October 13th, and as with all Telltale games, will release episodically. Buying the game will give you episode 1 on the spot, and the season pass for the other four episodes.